In Catawissa, the dead don’t always stay where you put them… 17-year-old Verity Boone expects a warm homecoming when she returns to Catawissa, Pennsylvania in 1867, pledged to marry a young man she’s never met. Instead, she finds a father she barely knows and a future husband with whom she apparently has nothing in common. 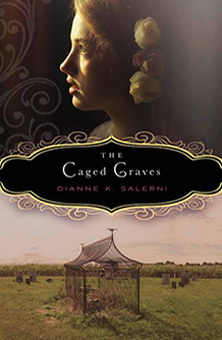 And a truly horrifying surprise awaits her: the graves of her mother and aunt are enclosed in iron cages outside the local cemetery. Nobody in town will explain why, but Verity hears rumors of buried treasure and witchcraft. Perhaps the cages were built to keep grave robbers out . . . or to keep the women in. Determined to understand, Verity finds herself in a life-and-death struggle with people she thought she could trust. 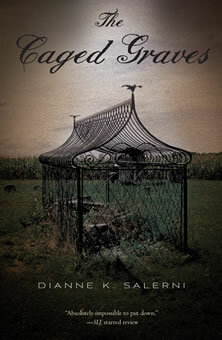 The Caged Graves is a historical mystery inspired by two very real graves in the town of Catawissa, Pennsylvania. One belongs to Asenath Thomas, wife of John Thomas, who died in 1852, and the other is the grave of Sarah Ann Boone, wife of Ransloe Boone. Sarah Ann died within a few days of Asenath and was the sister of Asenath’s husband, John. The purpose of the cages is unknown. They may have been decorative, although no other cages were erected here or anyplace else. They may have served as protection. But — for whom? The dead … or the living? We may never know the real story behind these two intriguing graves, but I owe Asenath and Sarah Ann thanks for inspiring the story of my very own Verity Boone. STUDENTS: Working on a book report or class project? Check out my FAQ (Frequently Asked Questions) Page for more information!